One of my favourite things about the holidays are the family gatherings. I enjoy catching up with relatives and friends and spending time eating, drinking, laughing and maybe a little dancing if things get crazy. Most of them I only see once a year (or less) since we live so far away from everyone. We are probably staying close to home this year because of our renovations. I’d love to be able to throw a holiday party, but I’m doing the wait and see approach since it all depends on the ongoing construction. I know many of you are preparing for holiday parties and thinking of recipes to try to impress your guests. Parmalat Canada has introduced a new product just in time for the holidays. Meet Black Diamond Cheese Spread in four yummy flavours: Original, Light, Sharp and White Original. Eat it on its own spread on a cracker, dip in veggies or nachos, or use it in a recipe the way I did. For holiday entertaining, you could keep it casual and put out a cracker tray and a few of the Black Diamond Cheese Spreads for your guest to spread themselves. 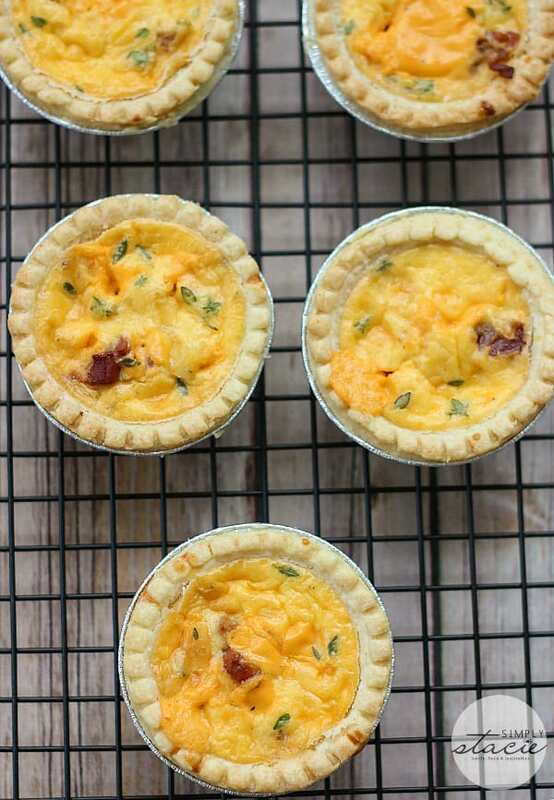 You could also make an appetizer like these Cheddar, Pancetta & Thyme Mini Quiches. Not only are they easy to make, but they are mouth-watering! I used about half a container of the Black Diamond Cheese Spread to make this yummy app. I’m tempted to make them lower carbs by not using the tart shells. I bet they’d be delicious as a mini-frittata! There’s a few other party appetizer recipes that I want to try like this Ham & Cheese Pita Pizza, Cheddar Chickpea Hummus and Bacon Cheddar Salsa Dip. Yum! 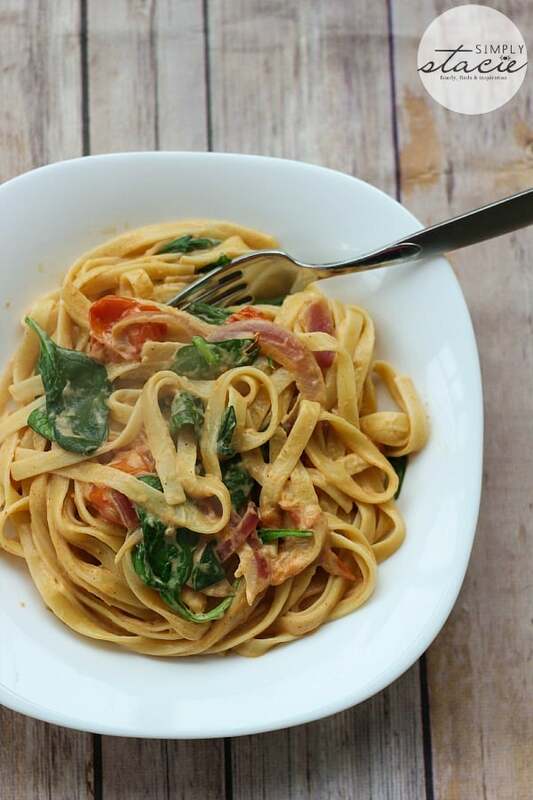 I also made this Chili Cheddar Fettuccine with the Black Diamond Light Cheese Spread. It was so creamy and delicious. Next time I’ll add some shrimp or chicken since John like meat in his pasta. I thought it tasted perfect as is though! 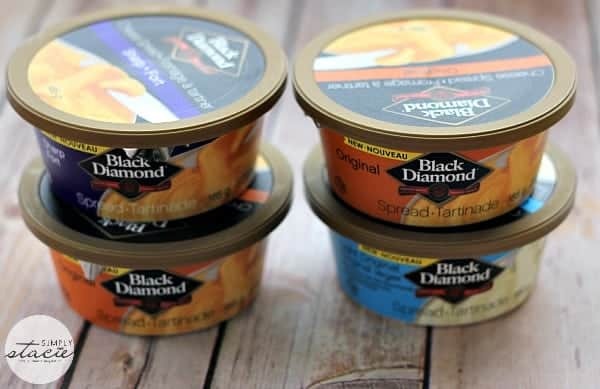 You can find Black Diamond Cheese Spreads in the dairy section of your grocery store. They come in 185g re-closable containers. I love the versatility, but most of of all I love the taste! 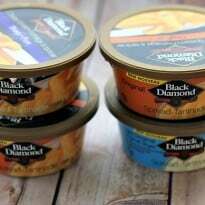 Get more recipe ideas and unique ways to enjoy Black Diamond Cheese Spread! Serve for an appetizing brunch! Preheat oven to 350°F. Put the tart shells on a parchment lined baking sheet and set aside. Heat a non-stick pan on medium heat and add pancetta and cook until they are crisp. Add in red wine vinegar and remove from heat. In a bowl, mix together Black Diamond Original Cheese Spread with the eggs. Mix in the cream, thyme, salt and pepper. 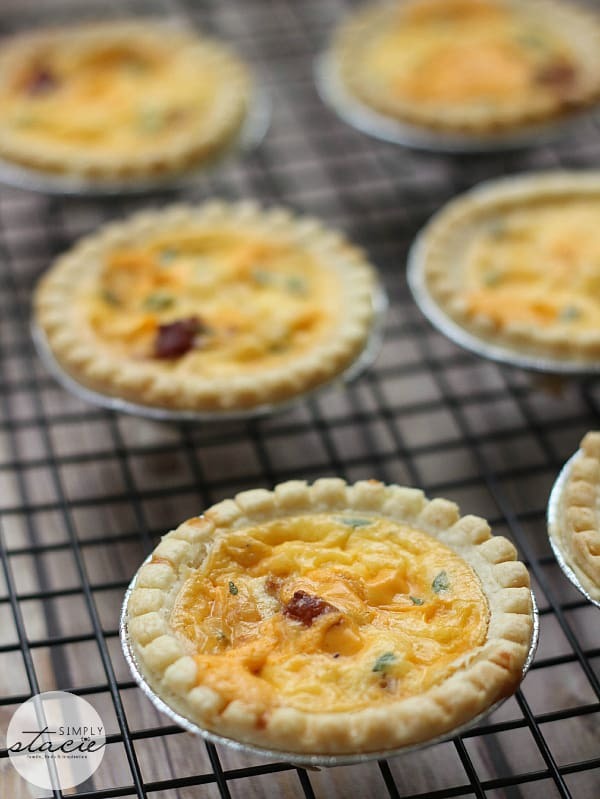 Divide the pancetta between the tart shells and top each with the egg mixture. Bake in the oven for 15 to 20 minutes or until crust is golden and the egg mixture is set. Cool for 15 minutes and serve. “Melt” brought up the Reverse Tuna Melt with Cheddar recipe, which is serendipitous, I think, because tuna melts were one of my favourite meals as a kid. The recipes you posted look great! I used melt it and it gave me a recipe for Reverse Tuna Melt with Cheddar. First, I tried ‘phyllo’ but nothing came up…. Then I typed in ‘pastry’ and Pigs in a Blanket came up. Chicken breast – Stuffed Chicken Breast. I typed in cheese and artichoke and cheddar dip come up. Yum! I put in “Salmon” and got back Smoked Salmon Crostini with Cheese. I typed in “scoop” and got this recipe: Hot Nacho Cheese Dip. I typed in “sausage” and got Flat Bread with Cheddar and Sausage. Yummm they all look delicious. I typed in “Chicken” and it came up with Stuffed Chicken Breast which sounds delicious! I bought this and you have given me some good ideas for the Christmas entertaining. Pingback: Healthy Appetizers: Make Them Ahead and Relax on Game Day!